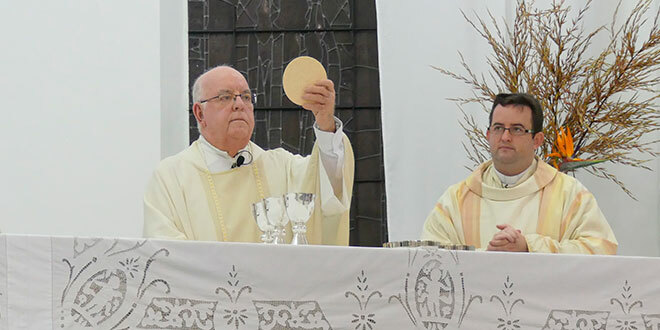 Thanksgiving: Fr John Daly’s final Mass as Bundaberg’s parish priest, at his recent Mass of Thanksgiving. 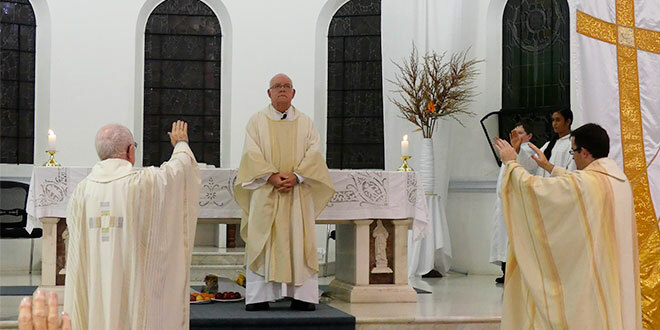 BOTH the Mass of Thanksgiving and the concert for Father John Daly’s retirement as parish priest of Bundaberg highlighted the traits of love and kindness, which this humble, non-judgemental man of God brought into the lives of all he knew. Despite heavy rain on the night, hundreds of parishioners gathered at Holy Rosary Church to thank Fr Daly for his seven years of leadership. He described his appointment as parish priest of Bundaberg as a highlight of his life because he was able to return to his home town, see more of his family, renew old friendships and minister to this multicultural community. The rain cleared before Saturday’s concert and attendees enjoyed the music – all of which was especially significant to Fr Daly. Despite his recent release from hospital, he gladly accompanied the orchestra when called upon unexpectedly to do so and read a poem about finding God by the great sixteenth century Spanish poet, St John of the Cross. As a school boy, John attended both St Patrick’s and St Mary’s primary schools in Bundaberg before completing his secondary education at the Christian Brothers. Several of his classmates attended his farewell Mass. He was in primary school when thoughts of joining the priesthood first crept into his mind. He dismissed them until Year 11 when they grew impossible to ignore. “We often dropped our bikes out the front of St Mary’s Church and went in to pay a visit on the way home from the Brothers,” Fr Daly said. “During one such visit, I agreed to give it a try. Seven years later, in 1970, Fr Daly was ordained and began a ministry of great variety as he worked in country, mining, city and cathedral parishes. People in Emerald, Rockhampton, Theodore, Mackay, Blackwater, Woorabinda, Bundaberg and surrounding areas came to know his kindness and love over the following 47 years. Blessing: Fr John Daly’s Mass of Thanksgiving ended with a blessing. Fr Daly was director of youth services for the diocese for seven years and spent some time living in a shelter with homeless youth. “We set up hostels in the early ’80s and later handed them over to the council – they’re still running today,” he said. Working with the homeless is something Fr Daly intends to devote more time to in his retirement. He will continue celebrating Mass and hopes to find more time for gardening and fishing. Spending six months in Ireland was another of his retirement plans, but health problems caused him to reconsider this idea. Sickness has had a profound impact on Fr Daly’s life but typically he has found a positive in that. “Sickness has helped me to understand and empathise with the sick who I visit,” he said. The early 1990s were healthier times for this priest and he spent two years in England studying human development, spirituality and counselling. 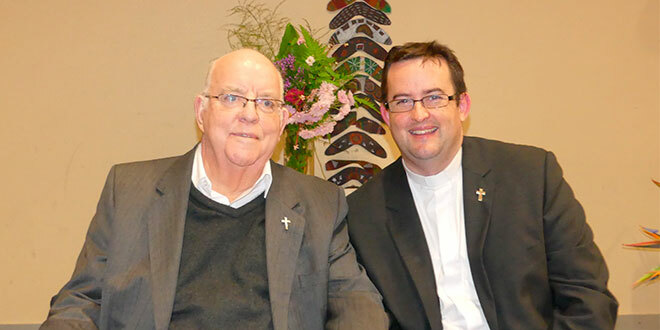 This enabled him to become director of ministry for clergy for 26 years giving retreats to groups of priests throughout Australia and New Zealand. While overseas, he was able to spend some holiday time visiting friends in Ireland. Although initially unsure if he was suited to the religious life, John’s decision as a 16-year-old, to “give it a try” was a sound one. His response to the scandals, which have plagued the Church in recent years was to work for reform from within and this was the advice he gives to parishioners. “I have learned to be a good listener, not to judge and to be present in people’s lives – in their ups and downs,” he said. “The searches for love and for God are the same. “I believe in what I’m doing and I enjoy it. The extent of the work which went into his Mass of Thanksgiving and concert was recognised and greatly appreciated by Fr Daly. “It is really humbling knowing that I’m loved by people and I thank them for the gift of love,” he said. Time Out: Fr John Daly and Fr Andrew Hogan relax at the barbecue which followed the Mass of Thanksgiving.